With many retailers looking to diversify their product offering, exploring ways to reach more consumers with different products as a means to remain competitive, one retailer in the Midlands is focusing solely on chairs. Husband and wife team Stuart and Justina Nurse, Directors of Stuart Mobility, explain how a decision to specialise rather than broaden its product range and a commitment to price transparency has helped drive continuous, sustained growth online and offline. Justina, a former Community Services Manager for Derby CVS, and Stuart, an ex-NRS Healthcare driver, both found themselves taking voluntary redundancy from their roles in 2011 to focus more on looking after their two young sons, eldest Charley and their younger son Fred, who has Asperger’s. A qualified quality assurer, Justina worked freelance so she could work around family life whilst Stuart started working from home, refurbishing and reselling various pieces of equipment online. It was by chance in 2013 that the couple was first introduced to the seating market when Stuart came across a second-hand rise recliner that he decided to refurbish and sell. “We took on a few more and realised there was a niche. These chairs were not cheap, imported chairs but British-made, premium products that many could not afford to buy new,” said Justina. Stuart began focusing on taking second-hand chairs, refurbishing them and, notably, delivering them to buyers. “The second-hand seating market is unique,” he said. “Many people really want these chairs but are unable to buy new, so there is a demand to buy second-hand but the biggest barrier people face is collecting them because chairs are not small or light. For the following two years, Stuart worked as a sole trader from his home with Justina, refurbishing and selling chairs online, before establishing Stuart Mobility Ltd in May 2015. Whereas many mobility retailers’ origins are frequently found in bricks and mortar stores, building their online presence later, Stuart Mobility’s history is the opposite. The company had first envisaged a future purely in e-commerce before realising early on that customers were keen to interact with the company and products offline. “A year before we moved to our first retail premises, we believed, somewhat foolishly, the website would be our shop because we wouldn’t grow substantially,” said Justina. The pair soon realised that an online proposition was unable to meet the needs of the business or its customers as demand grew from customers wishing to see the chairs. Stuart and Justina even turned their garage into a quasi-makeshift showroom. “We insulated the garage, installed French doors and more. It still had our tumble dryer in but it became a kind-of mini showroom, as well as our family utility room,” recollected Justina. During this time, the pair continued selling refurbished chairs from their home until a fortuitous meeting at a set of traffic lights introduced them to the new chair market. “It really was a bizarre meeting,” recounted Justina. Not one to miss an opportunity, Ben beeped his horn for Stuart to pull over, introduced himself and left his card for the two to meet-up. The two parties met at a local coffee shop and Ben introduced Stuart Mobility to Repose’s range, as well as made-to-measure chairs. “He mentioned made-to-measure and measuring customers and I remember thinking, “what do you mean I have to measure the customer? !” It was something I had never done before so it was slightly overwhelming, however, Ben was great. He took out his tape measure there and then and started telling and showing us all about it,” she told THIIS. For the seating specialist, the turning point came when a daughter and her mum visited the couple’s home to view a refurbished chair to buy. “Fred had a full-size, electric piano which was also in the garage because it was still our family garage,” said Justina. “Because he is autistic, he doesn’t pick up on signals so I couldn’t drop the hint that we needed to leave the room so Stuart could focus on the mum and daughter. Stuart ended up serving the pair whilst Fred continued to play in the room; it was almost like having background music whilst they were shopping! Having traded from their home for just under a year, the husband and wife team made the decision to move to their first retail premises in Willington, Derbyshire in April 2016. “As the website grew and more customers came to visit us, we started getting more requests and discovering more customer needs, such as people who were in need of chairs desperately quick for parents coming out of hospital,” recalled Justina. As demand grew, the company began taking on more products, working with more suppliers and learning rapidly learning more about seating, beginning its retail journey in earnest. In October 2018, the company upped sticks and moved to a larger building in Burton-upon-Trent, providing it with substantially more space including an office, showroom, warehouse, disabled access and free parking for customers. “We now have a good selection of chairs from Repose, Cosi-Chair, Primacare and the new Dorchester from Pride but our business has also started to grow in the healthcare range of chairs. We needed more space to showcase and potentially stock more chairs,” said Justina. Despite the company’s name, Justina emphasised that Stuart Mobility is not a mobility retailer in the traditional high-street sense. “I didn’t want to call our retail unit a “shop” as we were never dependent on footfall,” remarked Justina. The duo’s retail strategy was not always so clearly defined however, with the decision to specialise solely in seating evolving over time. “A couple of years ago, I thought about going down the traditional retail route and had a great location in mind,” continued Justina. Convinced to try selling other mobility ranges, the company briefly stocked some mobility scooters in its formative years, with Stuart attending a one-day training course to learn more about mobility scooters. “We quickly realised that people visiting us were not there for mobility scooters and we didn’t have enough knowledge about them to sell them effectively,” acknowledged Stuart. After the training day, he says Stuart Mobility’s strategy became clearer and the pair decided to stick to what they were passionate about. Often, retailers will look at diversifying its product offering to attract a wider customer base, however, for Justina, she underlined that in the mobility industry, selling equipment safely and effectively requires expert knowledge. “We really do not want to sell other types of mobility products. I think if we had become a traditional mobility shop straight off the bat, we might have fallen into the trap of being a jack of all trades but master of none,” she noted. “To do these products and customers justice, you really need in-depth knowledge of wheelchairs, scooters, rollators, hoists, stairlifts and more. Building up all that knowledge takes a lot of time. Rather than aiming to be all things to all people in the mobility sector, Justina says she is happy focusing all of her attention on one product range, providing her and Stuart the space to focus on providing high levels of customer service. “I think if we diversified, we would be run off our feet and we wouldn’t have been able to grow steadily the way we have, as we would have needed to borrow to afford to stock, manpower and the general overheads associated with a high-street shop,” she said. Now settled in its new Burton-upon-Trent building, the company is seeing more customers visiting its showroom, often finding the retailer through its website. Justina told THIIS she believes the company has found the right combination of online and offline activity. “I read the articles in THIIS about the different thoughts in the industry relating to online vs brick and mortar retailers, especially concerning safety and, for us, we have tried to consciously combine both,” said Justina. Importantly, Justina stressed that any purchases placed directly by customers on the company’s website are telephoned by her and asked qualifying questions to understand what their needs are and if what they have ordered is right for them. “Most internet-sellers and particularly box-shifters would not do that,” she added. In addition, for customers that may be unable to leave the house but want to see and feel the different chairs, the company travels to their home and brings a selection of chairs with them. “This isn’t the notorious salesperson turning up with a brochure and no clear pricing,” explained Stuart. Stuart and Justina pointed out that by bringing a selection of chairs to customers’ homes, people are able to understand more about the different fabrics, sizes and styles and how they can fit in with their homes, allowing them to essentially try before they buy. “You really can’t beat sitting in the chairs,” maintained Stuart. A central component to Stuart Mobility’s retail approach is its transparent pricing model which, according to Justina, is one of the fundamental reasons behind the company’s success. “When we first started, I did my homework and found a lot of retailers did not include prices on their websites, instead, offering to send out a salesperson,” highlighted Justina. For the retailer’s off-the-shelf ranges, showing prices was a simple decision. With products such as the healthcare range of chairs offering customers a rather extensive range of options at different prices, displaying prices can be a trickier affair. “For our healthcare range of chairs, we were adamant we need to publish the prices online. There are not many companies selling healthcare chairs that have the prices up or will say ‘starting from’ without including the prices for optional extras. I wanted people to know exactly what our prices were, even with the different add-ons,” confirmed Justina. On Stuart Mobility’s website, visitors not only see the basic price of its healthcare chairs but also the different options available, with the price of each option. When a customer clicks on an add-on, the price of the chair updates on the page so customers have a clearer idea of the price of the product. The pair say more companies in the seating sector need to adopt this model, clearly displaying all pricing so consumers are able to make an informed choice. Additionally, the seating retailer has invested in its own brochure which includes a price guide, something that has been well-received by healthcare professionals, says Justina. “Almost every time I hand it to a healthcare professional and point out the price guide, they say “really? !” They are so used to having reps come out to see them and then offer to send them a quote. Being a relatively new kid-on-the-block, Justina says she was keen to start building and showcasing the company’s credibility and trustworthiness. In 2015, the company signed up with Derby City Council’s Buy with Confidence Scheme, a trusted trader program which reviewed the company’s customer service history, policies and procedures. “The head Trading Standards Officer came out to see us at our home as we didn’t have our own place of business at the time, picked seven of our previous customers and said he was going to contact each one to find out what kind of service they received,” recounted Justina. The company joined other local organisations over the years and, in November 2018, became a member of the British Healthcare Trades Association (BHTA). “We recently noticed that because of all our local associations and listing, we looked very local and thought it was time to think bigger,” clarified Justina. Additionally, the company says gathering feedback from its customers helps the business build and showcase its integrity and ethical way of working. “Our testimonials speak volumes about us,” said Justina. One of the specialist seating segments Stuart Mobility has seen particular growth in over recent years are healthcare chairs, however, the demand originated from the company’s growing understanding of the needs of its customers. “The demand first came from the domestic market and was born from the public ringing up and asking for chairs, but after going through the assessment with them, they would ask for little things which we started to pick up on,” described Justina. 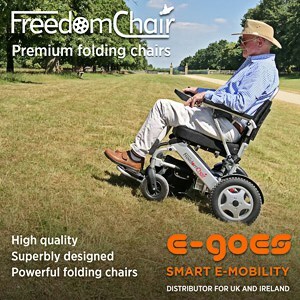 As their knowledge of the different healthcare chairs on the market grew and by showcasing both the products and prices across its literature, Stuart Mobility began to receive enquiries from other areas of the market. “We started to see considerable interest from care homes, who were interested in the healthcare ranges,” continued Justina. Over the years, Stuart Mobility has built close ties with a number of its suppliers, carefully deciding which products to offer customers. The company has continued its focus on British-made chairs, just as it did when refurbishing chairs from its garage over half a decade ago. “As a rule, we try to stick to British manufacturers as it is one of the last industries of furniture making that this country has left, so it needs to be supported,” said Justina. As well as having good working relationships with the manufacturers it works with, the couple explained that they also look to ensure they stock and sell chairs where there may be gaps in their offering. “It really is driven by customer need. As the number of customers increases, we come across different needs and gaps in our range where we may not have a solution for which needs to be filled,” said Justina. By sticking to its strategy and staying true to the notion of developing organically, Stuart Mobility has achieved impressive, sustained growth over the past three years. From humble beginnings, selling reconditioned chairs from the family home whilst their son played the piano, to its current operations, the pair say they are careful to ensure it can walk before attempting to run. “We are quite proud of ourselves,” said Stuart, modestly. This gradual journey has allowed the company to figure out and refine its strategy and identity, giving it room to find its feet without fear of failure. “Trying out scooters was the perfect example of that. We started small, gave it a try and realised it just didn’t fit with the kind of company we wanted to be,” added Stuart. Speaking with Justina, she underlined that the company is standing firm with its decision to specialise in seating, with no plans to diversify on the horizon. “Our specialist knowledge and the way we are approaching retail gives us an edge in the market, however, all that knowledge is in my and Stuart’s heads,” she observed. With ambitions of becoming a key supplier for community equipment providers and growing its healthcare activities, the couple stressed all steps have to continue to be small and manageable. “What is important is that I never want to lose that customer service ethos which drives us, so we’ll be sure to continue as we have been, one step at a time,” finished Justina.